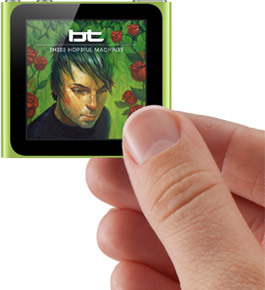 Apple revamped its entire iPod line-up at its September event last week, but for me, the biggest winner is the iPod nano. I’ve been using the new iPod nano for almost a week now and it is now my favorite iPod. With its multi-touch screen and a clip, the nano is perfect for what I use an iPod for. We all use our iPods for different things. Some people exercise, others sit comfortably and listen to music while reading a book. I travel. For convenience, I typically use the iPod shuffle when I’m on the road because I can clip it on my shirt and go. Now with the nano, I have that same convenience, plus I have the multi-touch screen and the ability to choose a particular song that I want to play. I see the iPod nano as an on-the-go device, so I’m not looking for apps, videos or games to play. I want something that will give me my music quickly and easily. The new nano does exactly that. The nano has three buttons on top — volume up, volume down and sleep/wake. Quite honestly, that’s all you need to operate the nano. The nano is all about multi-touch. From the home screen, you simply swipe left or right, choose the function you want and tap it. It’s all very similar to the way we have become accustomed to working with the iPhone. If a song is playing, you can tap the screen again to bring up the player controls to pause, fast forward and rewind. If you swipe again, you are brought to a screen that allows you to scrub through a song, turn on repeat, shuffle, and do a Genius Playlist based on the current song. To get out of any menu you’re in, you just need to swipe and you’ll find yourself back out to the main menu in no time. Swipe to get in, swipe to get out. It couldn’t get any easier than that. Of course, Apple being Apple, they included a little extra multi-touch swipe for nano users. If you clip the device on yourself and the screen is upside down, you can use two fingers to rotate the screen 360 degrees, so it is facing you. The nano comes with icons for Playlists, Now Playing, Artists, Genius Mixes, Radio, Podcasts, Photos, Settings, Songs, Albums, Genres, Composers, Fitness and Clock. The music settings give you options for Shake to Shuffle, Sound Check, EQ, Volume Limit, and one that I really like, Audio Crossfade. 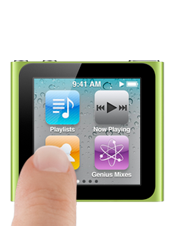 Of course, the iPod nano has a Built-in FM Radio and a pedometer for those that use the device for exercising. It also features VoiceOver, another feature I’ve really come to like. If you have the Apple headphones with the Remote and Mic, you can even control the nano without touching the screen. 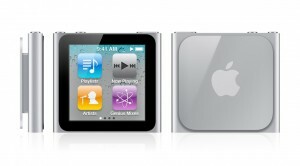 The iPod nano is without a doubt the big winner in the September releases for Apple. If it were up to me, everyone would have a nano.